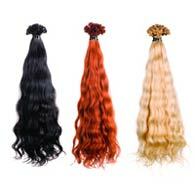 SO.CAP.USA® Hair Extensions offers 100 percent human hair in 81 different colors and three textures; straight, wavy and curly. We are able to achieve the look that you have always wanted in spite of the texture, length or density of your own hair. The pre-bonded hair (bonded with 100% Keratin Tips - the same protein that makes up your own natural hair) makes it simple to apply and the bond is made of a keratin protein so there is no wax or glue. There is no damage to your hair. 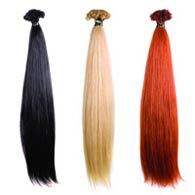 The extensions are virtually undetectable and very easy to maintain. We're now offering Crystal extensions of pure Swarovski stones in 20 different colors. Crystal extensions are fastened on a very resistant thread of silk and are available in semi-permanent keratin protein bonds or in clip-ins for a more temporary look. They can be used in combination with Hair Extensions or simply alone; beautiful polychromes and magical color effects create a stunning look. 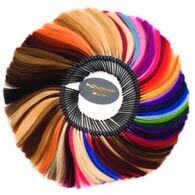 You can see examples of how hair extensions will change your looks in our Hair Gallery. 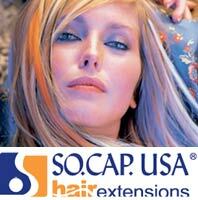 SO.CAP hair extensionist have been professionally trained and certified to provide only the highest quality hair care. 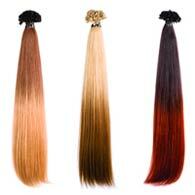 Keratin is pre-applied to the trimmed end of each hair extension. 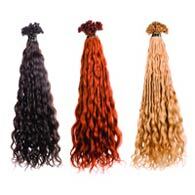 The hair extension is then fused with your natural hair creating a 'natural' bond. Remember that Keratin is the same protein that makes up your own hair. Following the application of your new hair extensions, it is extremely important that a mainenance and follow-up schedule be developed. Remember that regardless of how natural and real your hair extensions look and feel, they must be properly cared for to ensure long-lasting beautiful results.